On November 24, US-supported terrorists fired Western-supplied shells containing toxic chlorine at al-Khalidyia, al-Neel, and Jamayat al-Zahra Aleppo City neighborhoods. Unless quickly treated, toxic chlorine inhalation can cause asphyxiation and other severe respiratory problems. According to area hospital sources, 107 civilians were admitted, suffering from what was believed to be chlorine gas inhalation, acute cases treated in intensive care. The US, UK, France, Israel, the Saudis and Turkey are involved directly or indirectly in delivering sarin, chlorine, and other toxins to jihadists in Syria they support. Trump regime imperial partners delivered toxic chemicals to White Helmets jihadists, masquerading as civil defense workers. “The peaks of these deliveries were synchronized with the bold statements of the US State Department and other US agencies about the readiness to deal a missile strike on Syria in case of the alleged use of chemical weapons by the government,” Russia’s Defense Ministry explained. Al-Qaeda-connected White Helmets were likely involved earlier. 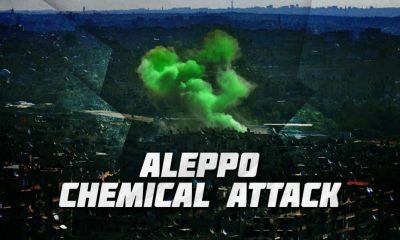 Shells with toxins fired on Aleppo City came from Idlib’s demilitarized zone by Turkish-supported terrorists. The Kremlin pretends Erdogan wants conflict resolution he’s clearly going all-out to continue – wanting Assad ousted, Syria’s sovereignty destroyed, and northern parts of the country annexed for a greater Turkey. Fact: Virtually everything said about Syria, and Russia’s involvement in combating US-supported terrorists, by the Trump and UK regimes, NATO, their imperial partners, and media press agents are bald-faced lies. Longstanding US, NATO, Israeli policy consistently blames victims for high crimes committed against them. Not a shred of evidence suggests Syrian and/or allied forces ever used CWs at any times throughout years of war. Indisputable evidence proved ISIS and other US-supported terrorists used them numerous times – the latest incident on November 24 in Aleppo City, surely not the last one. The State Department’s most recent statement (December 7) is all about “vindicating” US-supported jihadists, along with “pseudo-rescuers from the White Helmets” allied with them against sovereign Syria and its people. The US statement and others like it are also “geared toward diverting attention of the world community from the crimes committed by US (and allied) warplanes,” involved in terror-bombing Syria since summer 2014 – responsible for massacring tens of thousands of civilians and destroying vital infrastructure.